Motu iti is a Tahitian word which means "little Island." She was created in 1992 by Jerry Montgomery with a full keel. One of just a few that was sold without the centerboard. Drawing close to 3 feet, she is a very stable platform (hence the name) and tracks very well without side slip while beating, even in high wind conditions. When Motu iti was purchased from the original owner in 1997, she was called "Valhalla" and registered in Alaska. Belonging to a retired Army Officer who lived in New Mexico. She was renamed by Eldor and Dorothy after she was brought home to Texas. "We trailer Motu iti to various lakes in Texas; Grapevine, Joe Poole and Whitney Lakes were our favorites. Most recently she is dry sailed mast up at the Arlington Lake Yacht Club. Most of the sailors at Arlington are fleet racers and we have done that in our past, but Motu iti was purchased to cruise. A steady breeze at sunset, good background music and a bottle of champagne for us was most fitting. She will be missed, we've had a great time with her and there are lots of memories." The Eisens towed Motu iti behind their motor home and wanted to bring along a couple of scooters to act as (green) ground transportation while on sailing trips. This prompted some thought and solution. First you'll notice the dual axle configuration. This was added as well as a braking system. Note the scooter racks on each side of the forward area of the trailer. A cover was made from Sunbrella fabric with her Sailrite LZ sewing machine. Because there was no pattern available to the general public an area would be measured, tacked, fitted and then finish sewn. Note also the rudder cover. Looks like Dorothy is staying busy. Dorothy has compliments for Sailrite. A problem developed during the fabrication and a call to Sailrite was all that was needed, The Representative at Sailrite walked Dorothy through the procedure and the outcome is great. 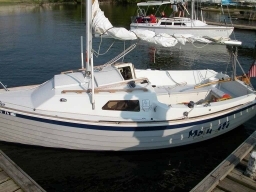 Side Note By Jerry Montgomery - April 6, 2006: "The few fixed keel M17's made in the early 90's were fiberglass; an extension of the regular 12" fixed keel. Seems like the total depth (not draft) was 21". A good boat but I've never raced one so I can not say how fast they were. I did however sail on one a couple of times and she felt good. Same ballast as the keel / centerboard model, but the weight is centered lower. The best of worlds, except for the launching draft of the fixed keel". Motu iti was sold to a new owner in late 2016. She is now in Florida.